Demonstrators in downtown Bangkok. Credit: Kalinga Seneviratne/IPS. SINGAPORE, Jan 19 2014 (IPS) - Street demonstrations in the Thai capital reflect the disillusionment of growing middle classes across Asia that see multi-party democracy as a playground for the corrupt rather than a process that elects lawmakers to serve society and the nation. “For more than 20 years, Thai democracy has seen one incompetent and corrupt government after another,” Thai political and social commentator Voranai Vanijaka wrote in the Bangkok Post this week. “For more than 20 years, Thai democracy has seen one incompetent and corrupt government after another." Anger against corruption expressed by India’s urban middle class resulted in the dramatic rise of the Aam Aadmi Party, or the party of the “common man”, that recently won power in the national capital, Delhi, just a year after it was launched. There are similar moves afoot in countries like Indonesia, Sri Lanka and the Philippines whose political systems are also producing lawmakers who are seen to come to power to serve themselves and not society. Thailand’s anti-corruption movement gathered steam two months ago when the ruling Phue Thai Party, led by Thailand’s first female Prime Minister Yingluck Shinawatra, tried to pass a blanket amnesty bill through Parliament that would have absolved politicians convicted of corruption and serious crimes linked with political conflicts since 2004. The government dressed it up as a bill of reconciliation and unity after years of fierce political battles between the urban “yellows shirts”, who represent the traditional power elites of Bangkok, and the “red shirts”, or the rural electors, mainly from the northeast of the country, who make up about 70 percent of the electorate that firmly supports the Shinawatra government. Though the amnesty would have covered all sides of politics, it was widely seen in Thailand as a bill designed to allow former prime minister and Yingluck’s brother, Thaksin Shinawatra, to come back to the country a free man. The billionaire businessman-turned-politician has a two-year jail term for corruption hanging over him and has been living in self-imposed exile in Dubai after he was overthrown by a military coup in 2006. The Shinawatras, through their enormous wealth, have created a powerful political machine which, their opponents allege, buys votes from the rural poor by offering them populist policies such as higher prices for rice farmers, village health centres and generally helping improve rural infrastructure. The traditionally wealthy and powerful urban middle class have felt powerless against this machinery which has been able to deliver one election victory after another and propel the Shinawatras into national power without depending on urban support. Two months ago this minority was able to mobilise enough people from the wealthy, the middle class and even the poor of Bangkok, and took on Thailand’s most potent political machine. They forced Prime Minister Yingluck to shelve the bill that would have granted amnesty to her brother. Not a shot was fired, no blood spilled, no bombs thrown and no buildings burnt. 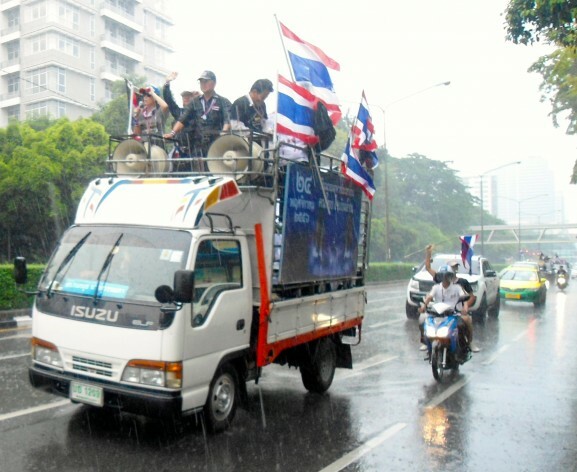 Thus the latest incarnation of a Thai anti-corruption movement came about. “These citizens have diagnosed a worsening corruption problem in Thai bureaucracy and politics and are refusing to tolerate it any longer. Their call for change is justified and credible. Thailand is crying out for a more just society in which the law is fairly enforced,” argued The Nation newspaper in an editorial on Jan. 16. Propelled by this success, the movement has now embarked on a campaign to shut down government agencies and force the Shinawatra government to postpone elections scheduled for Feb. 2 that the ruling party is certain to win because its rural support base is still intact. The opposition Democrat Party, which is supporting the protests, is boycotting the elections. By doing so, it has created a scenario where even if the elections are held as scheduled, and the Phue Thai Party wins, it may not be able to form a government. With 28 constituencies with no candidates and 22 others with only one candidate each, the likelihood is high that the election will not deliver the required 95 percent of MPs in Parliament. The protest leaders are calling for an unelected “people’s council” of nominees to be set up to reform the electoral system before elections are held. Some city people are even arguing that the one-person-one-vote system does not work, and they deserve more weight for their votes because they are the ones who pay taxes and not the rural voters. Professor Pasuk Phongpaichit at Chulalongkorn University in Bangkok disagrees with this argument. In a comment published in both the Bangkok Post and Singapore’s Straits Times this week, she noted that in the past two decades Thailand’s per capita income has increased three-fold, and this has benefited rural people, who have also become taxpayers and have been empowered politically. There are allegations being made about the leader of the protest movement, former Democratic Party lawmaker Suthep Thaugsuban, such as building business interests in land and rubber while being in politics. Pasuk is against suspending the political system to craft reforms. She sees hope in the moves behind the scenes by military, academic and business leaders to broker a solution to the current political conflict. Wait a minute – you say the government is backed by 70% and is “buying their votes” – by delivering economically beneficial policies? Doesn’t sound so bad to me.